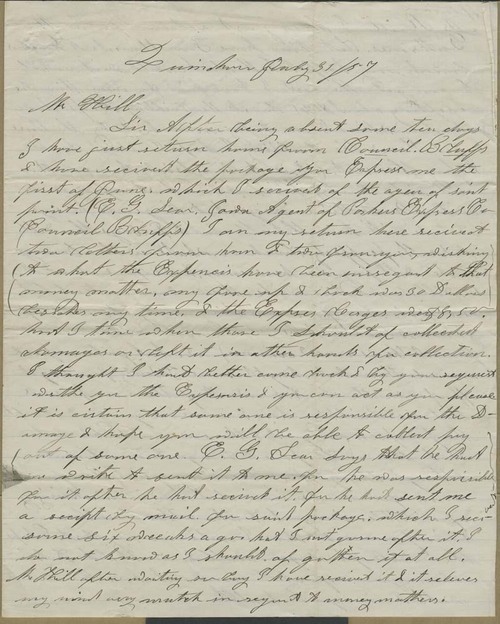 Albert Morton wrote from Quindaro, Kansas Territory, to Hiram Hill in Massachusetts, providing for him some conclusions regarding Samuel N. Simpson's fraudulent business practices. Morton reported that, from information provided by Simpson's brother, Samuel N. Simpson had taken $40-50,000 from the Quindaro Town Company, and deeded the land of others. He had also given Hill an unauthorized bond, which was not valid. Abelard Guthrie, however, according to Morton, had offered to give Hill title to some land, in order to minimize financial losses brought on by Simpson's actions.